The ERIGrid project focuses on development of advanced simulation-based methods to test and validate smart grid scenarios. In the ERIGrid webinar “Co-Simulation Based Assessment Methods” on 9 April 2019 at 10:00 AM – 11:30 AM CEST, the project partners will discuss with the attendees the development and application of various models, tools and test systems for conducting co-simulation. The added complexity of simulator interactions with increase in system size is one of the main focus areas of the work done in the project. Webinar will also include a live demonstration to showcase the workings of co-simulation models developed in ERIGrid. ICT 2018 took place in Vienna on 4-6 December 2018. This research and innovation event focused on the European Union’s priorities in the digital transformation of society and industry. RICH2020 hosted a networking session “Pushing Business with Research and Innovation Infrastructures” on December 4th with the goal of Connecting Industry, including SME, with so far mostly research driven Research and Innovation Infrastructures is one of the major aims of R&I policy in this field. The European Strategy Forum on Research Infrastructures (ESFRI) presented, at the International Conference on Research Infrastructures (ICRI-2018) held in Vienna on September 11th 2018, the updated Strategy Report and Roadmap 2018. The Strategy Report on Research Infrastructures includes the Roadmap with ESFRI Projects and ESFRI Landmarks and the ESFRI vision of the evolution of RIs in Europe, addressing the mandates of the European Council, and identifying strategy goals (http://roadmap2018.esfri.eu/). The ESFRI Roadmap 2018 is a clear demonstration of the potential of European cooperation in developing visions and sustainable perspectives for an interoperable Research Infrastructure ecosystem as a crucial asset of Europe. At the following link the video of the presentation. The 4th International Conference for Research Infrastructures 2018 (ICRI 2018) was held in Vienna, Austria, on 12-14 of September and it was co-organised by the Austrian Federal Ministry of Education, Science & Research and the European Commission with participants from more than 50 countries. Also, speakers representing high-level stakeholders from across the globe and high profile institutions intervened in the debate. A thorough guide for effectively communicating and boosting the impact of your project in the era of social media. The section has been updated with the answers to the most frequent questions that have been submitted in relation to the new Research Infrastructures WP 2018-2020. These FAQs aim to clarify the scope of the calls, topics and areas within topics. To support the preparation of proposals, RICH, the network of National Contact Points for Research Infrastructures, in cooperation with the European Commission's Research and Innovation Directorate-General, organized an Information Day on Thursday 30 November 2017 in Brussels. The aim of the day was to inform potential participants in the new Work Programme 2018/2020 and to offer some unique opportunities for networking. “Innovation is like love: you can’t buy it, you can’t force it”. The somewhat lame metaphor from ICOS-ERIC’s Director General Werner Kutschstuck like no other at the II RICH Symposium, held on the 8th of May, at the Gulbenkian Foundation in Lisbon. The objectives of the symposium, which was organised in collaboration with the European Commission, were to showcase approaches to innovation taken by Research Infrastructures and projects in all scientific domains, as well as to provide a floor for the discussion of policies and incentives for innovation. If the presentations made during theday are representative of the European Research Infrastructures, then all stakeholders should feel inspired and motivated by the creativity and resourcefulness ofthe research community. Barcelona Supercomputing Center-Centro Nacional de Supercomputación (BSC-CNS) is the national supercomputing centre in Spain. It specialises in high performance computing (HPC) and manage MareNostrum, one of the most powerful supercomputers in Europe, located in the Torre Girona chapel. BSC is at the service of the international scientific community and of industry that requires HPC resources. The multidisciplinary research team and computational facilities –including MareNostrum– make BSC an international centre of excellence in e-Science. Since its establishment in 2005, BSC has developed an active role in fostering HPC in Spain and Europe as an essential tool for international competitiveness in science and engineering. The centre manages the Red Española de Supercomputación (RES), and is a hosting member of the Partnership for Advanced Computing in Europe (PRACE) initiative. Follow the latest news on Horizon 2020 - Research Infrastructures programme on Twitter! The European Network of National Contact Points will keep you updated on news, events, calls for proposals and policy issues on Infrastructures. 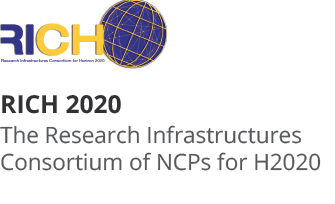 RICH 2020, the European Network of National Contact Points (NCPs) for Research Infrastructures in Horizon 2020, facilitates transnational cooperation between NCPs, promotes the effective implementation of the RI programme, supports transnational and virtual access to RIs and highlights the opportunities offered by Research Infrastructures - at the European and international level. The Network builds on the experience of previous networks of National Contact Points for the Research Infrastructures programme (EuroRIs-Net and EuroRIs-Net+, 2007-2013). 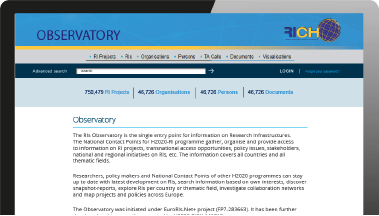 The RIs Observatory is the single entry point for information on Research Infrastructures. Distribution of documentation, Assistance in partner search.